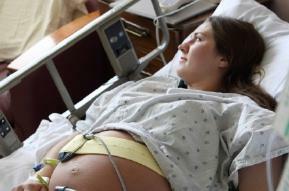 Some of the myths of childbirth may terrify a new mother-to-be. The good news is that they are myths. Childbirth is usually a positive, rewarding experience that is safe for both mother and child. The following five myths are often the most worried about by new mothers. Consider any myth you may hear carefully. If you are concerned about your health, your risks, or those of your child, speak to your doctor about them rather than stress about myths. Although television shows like to present a pregnant woman's water breaking at any time, it is possible that your water will not break until after full labor begins. Your "water" is the amniotic fluid that surrounds the child prior to his or her birth. During the final weeks of the pregnancy, you may be watching for a gush of water to occur to alert you that you are in labor. Most women do not experience this. Labor often begins first and, in many cases, your doctor will need to break your water for you. Do not make the mistake of waiting for it to happen. Several myths exist regarding labor induction. Doctors may induce labor for a number of reasons, though the most common reason is to ensure the child's health. Doctors use medications to induce labor, which simply gets the body to give birth to the child. When done properly, there are few, if any, risks to the child. It is important to point out that induction does not always work. If there is no cervical dilation or effacement, the induction may not be successful. The best possible time for induction is after the cervix has begun to dilate. Your doctor will check you prior to inducing labor and may determine that your cervix is not ready. As long as the child is not in distress, the induction may have to wait. Labor can be painful and it may be obvious, but it may not be, too. Many women give birth easily and experience very mild pain or just discomfort. Early labor may last for days prior to the baby's birth, but you may not realize that you are in early labor. Some women dilate four to five centimeters before moving into active labor. The best way to know if you are in labor is to look for regular contractions, even minor ones and those that increase in intensity, duration, and frequency. Cervical dilation is the true indication of labor. Menstruation cramps are very different from birthing contractions. Some early labor contractions may feel similar to menstrual cramps, but that is not what you should expect. The only comparison that may be possible here is that the location of menstrual cramps is the same location that contractions will come from. Contractions are a strong tightening that occurs throughout the midsection. Contractions are most often more painful than cramps. During the early years of doctors using medications to make labor more comfortable for the woman, the necessary information needed to safeguard both baby and child was not available. Today, things have changed. Although many women prefer a natural childbirth, unmedicated childbirth is not always an option. Natural childbirth is often a long, painful event. Pain management may be necessary. In some situations, women without any type of pain management may be unable to perform properly during birth. Many of the following myths of childbirth are important to know, too. Remember that your experience is likely to be unique. My mother's childbirths were short, so will mine be. From birth-to-birth and woman-to-woman, there is no real way to know how long the birthing process will be. If you are not in labor, your doctor will send you home. It is not true that you have to be in full, active labor to receive admission to the hospital. Nor is it true that if you go home, you will not be in labor. Childbirth eases with each child. This is not the case for many women. Every pregnancy is different.